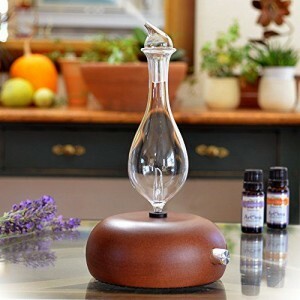 Best 10 Essential Oil Diffusers on the Planet! If you are just getting started with essential oils, one of the easiest ways to use them is a room diffuser. These work especially well during the cold and flu season as they kill viruses and bacteria that float through the air. For those of you who have recently discovered that (most) scented candles release dangerous toxins into the air, but love having a home with a sweet smell, essential oil diffusers are what you have been looking for. The two basic types of diffusers are nebulizing and ultrasonic. Nebulizing diffusers attach directly to the bottle. 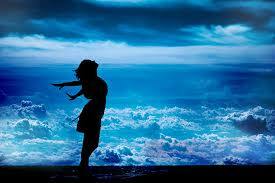 There is no need to add water or do anything else. You simply turn it on and you are ready to go. Some brands offer timers, which is helpful in case you forget that you turned it on. 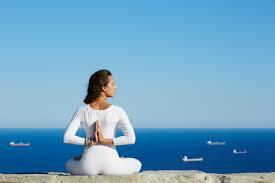 However, nebulizing diffusers use more essential oils than ultrasonic ones. The concentration is greater inside the room, however. They can be louder than ultrasonic ones as well. 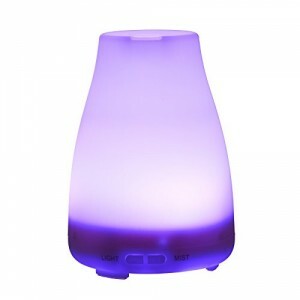 Ultrasonic diffusers use a mix of water and essential oils to cook up a mix that is released into the air. These are very quiet, cost a little less than nebulizers, and can double as a humidifier. 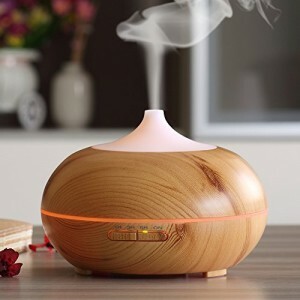 However, these types of diffusers take longer to set up, must be cleaned on a regular basis, and you cannot use citrus essential oils in them, such as lemon or orange. There are pros and cons to both of these diffusers and which is the right one for you will be your decision. We want to clue you in on the 10 best diffusers we have found this year, so that when you make your decision, you can find the best possible one for you and your family. This diffuser is so pretty, no one would guess it was also good for your health. It uses no heat and says that one diffuser covers about 1,000 square feet. The automatic low water level shut off is great as you never have to keep going back to check the water level. Comes in several colors to match your décor as well! 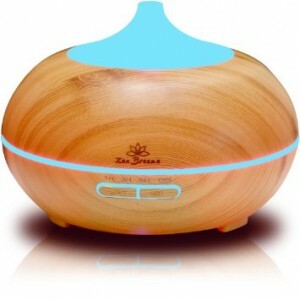 This is a Zen looking little diffuser, made from sustainable bamboo. It runs up to 8 hours on the high setting and 12 hours on low. Shuts down automatically if the water level runs low. It has a small strip of LED lights that goes around the diffuser. There are 7 different light colors to choose from. You can have the colored lights change colors, set it to one color, or turn the lights off completely. If you want a really sound sleep and a night light combo, this is the diffuser for you. This diffuser is white with a top that changes colors. Lights can be turned off completely, if desired. Runs for 4 hours and shuts off when finished. This model is super quiet! 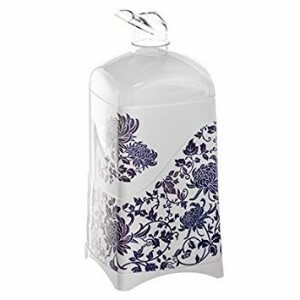 Made from BPA free plastic, this compact unit covers about 300 square feet. If you don’t need a great deal of humidity, this is the perfect unit for you. This one is so inexpensive and easy to use; you can put one in every room! This one also has 7 color changing LED lights that have a low and high setting. This one is praised for its ease of use. This allows you to run a timed mist cycle (30 seconds on, 30 seconds off) or continuous use. Made from BPA free plastic, this diffuser will run for 3.5 hours if set on the continuous mode and 6 hours on the timed mist cycle. This is brand new to the market and it’s going to be a huge best seller. Made from BPA free plastic, but looks like hardwood! Has 14 color LED lights, which can be turned off, and uses to heat. This model has a timer that you can set for 60, 180, or 360 minutes. It runs about 10 hours with each fill and is super quiet. 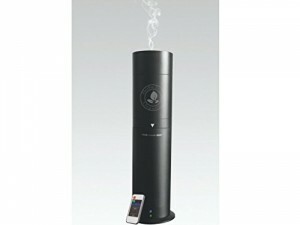 This is a cool mist humidifier, which you will really appreciate this winter. Wireless and waterless, the Nova diffuser charges lithium-ion batteries just like your cell phone. Unlike plug in diffusers, you can take this one anywhere you like- in your car or in the garage. This diffuser has 3 separate aroma intensity levels and is completely spill proof. This model is so quiet; you will probably forget that you have it on! This tall, silver beauty offers advanced NANO technology that uses no heat and no water. NANO particles will not leave that white residue on your furniture. This unit uses far less essential oils than other models. Even when set on the continuous 8 hour mode, it uses less than 1ml per hour. While it might weigh a bit more than other units (about 3 pounds) it is super heavy duty and will last for years. Comes with a remote control so if you put it on a shelf, you can change the settings or turn it off and on from your bed! How easy is that?! If you like things a bit different than the every day, this might be the diffuser for you. This diffuser looks very much like a candle in an old fashioned holder! It has a natural Beech wood base and all glass top for true purity. 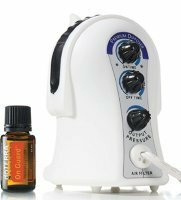 This diffuser has an auto shut off after 4 hours, as well as a 10 minute on/10 minutes off timer to help save money on essential oils. Uses no heat or water and is for indoor use only. This model is very lightweight at 1.2 pounds and is best known for never clogging up! One diffuser will clean 900 square feet. If you are a no nonsense, just want the basics kind of person, then this might be the perfect diffuser for you. The Gardenia model is made to maximize the therapeutic benefits of essential oils, without the fancy, schmancy stuff. This plugs into an outlet or a USB port, so you never have to worry about running out of batteries or recharging it. It uses no water and is very lightweight. This model features a timer and covers about 500 square feet. doTerra is the number one brand of therapeutic grade essential oils, so it only makes sense that they would have just the right diffuser for them! This is a powerful, yet compact model which offers state of the art cold diffusion. This means no water and no heat is needed! Easy to use controls right on the front of the diffuser make this one a no-brainer! doTerra has included 2 bottles, so you can pour your oils directly into the bottle and insert it into the diffuser. No more wondering if your essential oil bottle will fit! Covers 300 square feet. This one costs more than others, but the doTerra name means quality, so you can count on this one working for many, many years. Essential oils can bring a beautiful scent to your home or work area, keep the air clear of viruses and bacteria, while keeping humidity levels at levels that will stop dry hair, skin, and throats. Everyone wants the best for their family and diffusers are one way you can do that with almost no effort on your part.